You are asked as to how many of us are aware that behind every great religious system is a great metaphysical concept which has given power to the system itself. Upon pursuing the metaphysical concept is a theory that functions as a foundation of that greater truth. This greater truth lies in the source of the echoes of triads that surround us. From another perspective picture, if you will, two mirrors facing each other with such a trinity symbol between them reflecting back and forth ad inifinitum all its forms and aspects. Then it all can be seen as radiating from a single source. The power of three, reflected out, is the nature of reality and creation itself. The first seven chapters go into further depth on the powers of threes, winding their way through thousands of years of history, culture and science. These chapters give examples and background of the prevalence of threes and weave them together into a tapestry of all creation. There is the "official" recognition of the Christian Holy Trinity at the council of Nicaea in 325 A.D. (C.E.). Then Pythagoras and his concept that all is numbers is lightly touched upon. Other examples include Judaic (Kabballah), Islamic and pagan rites that incorporate threes. Other examples continue from Freud, Gurdijeff, and Bohm, among others. They show the overwhelming power of threes that are explicate through out our three-dimensional world. The "three" concept is a little muddied with examples and discussions that included Oneness, duality, and five-steps to reach the trinity secret. In chapters eight, nine and the conclusion, the purpose and shape of the concept is brought together, one could say like the triangular supports of a Buckminster Fuller dome. They explain that this trinity secret is the same secret explained in the 2005 movie; "The Secret". It is about the ability to manifest in one's life. They explain that it is for us to realize the universe is based upon the trinity of creator, the created, and the act of creation. If we are able to grasp this concept and realize that we are also co-creators ourselves, then we can give ourselves the ability to think something into existence. Think of it such that we as co-creators (spirit) can think/imagine (mind) things into physical manifestation (body). An important key is one's will and intention. The warning of "Know thy self" over the entrance to the temple of the oracle of Delphi was there for a reason. This is outlined in a scientific prayer and mind treatment. Ultimately we are being made aware that in understanding the trinity within all of us we can be co-creators with the ability to do acts of creation and create (manifest) our lives around us. 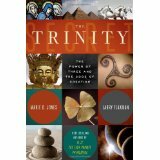 To order The Trinity Secret from Amazon.com, click here! Writing about a beloved and revered religious symbol can be considered quite controversial when your premise states that the symbol is found in every great religion. The Trinity Secret will no doubt cause quite a stir among those who believe strongly that the idea of a Trinity is exclusive to Christianity, namely Catholicism. But our job as writers and researchers is to explore and report, and once we began exploring the Trinity, we found it everywhere we looked. From the creation stories of ancient civilizations and the cosmologies of indigenous cultures, to folklore and myth, we found the presence of a triune nature of reality and of creation itself. Yes, we even found it in studies of human language patterns, fairy tales and political speeches! We found the idea of a Trinity in science, in nature and in the structure of the human brain, as well as in Freudian psychology, and the levels of human consciousness we are just beginning to fathom in the burgeoning field of Noetics. The number 3 is potent and powerful, much more so than any other number, and there are reasons for this. These reasons are incredibly simple, yet highly complex at the same time, for in their apparent simplicity there exists the actual code by which all of creation is manifested into physical form. And to think that we as human beings can use this very same code to create our own reality as well, is truly an empowering and life-altering realization. Did the Catholic Church know about this when they adopted the Trinity as part of the belief system that would stand to this day? We imagine they did, for their own knowledge of the Trinity came from those before them who spoke of a triune code of creation and of divinity itself. Whether we are talking about the teachings of the Greek sage Hermes or ideas passed down from pagans who studied the structure and laws of nature through sheer observation, the Trinity symbol was already a part of our psyche and an archetype we understood on a deeply subconscious level. When putting this book together, we knew we were treading on sacred ground, but for us, we believe that what is sacred to one group of people is usually sacred to other groups as well, and we found this to be true with the Trinity. It is a revered symbol in every religion, and we as humans react to Trinities and threes in a way we may not understand on an intellectual level, but certainly do on an intuitive level. Most, if not all, of the symbols utilized in religious traditions, from a virgin birth to the concept of resurrection come from far more ancient belief systems than we were taught. Many of these symbols were a part of the human experience since our species first walked the earth, but until we were able to use the written word to communicate and document these experiences, we could only tell our stories orally and hope they survived in some recognizable form as they were passed down the generational chain. We are ancient and primordial. Though our bodies have evolved, and our environment is far different now than it was millions of years ago, deep within our collective consciousness are the seeds of knowledge that are profound and ancient, perhaps as old as the Universe itself. We may have taken those seeds and, over time, grown some pretty distorted fruit, but the original intent of those seeds remains. With the growing interest today into the law of attraction teachings, Noetics and the power of intention and thought to create reality, added to the fascination with quantum physics, the seed of the Trinity has finally grown into something amazing and accessible to all. If a symbol is true for one people, it should be true for all, simply because we are all created by the same creator, via the same process of creation. This is the power of the Trinity at work, and it really isn't a secret at all. It's been staring us in the face, hidden in plain sight for thousands of years, as most of the truly important secrets are. We are just now beginning to "see" it and realize our roles as creators creating creation.